Near sunset, we moved down near to the dock. We were blessed with a very colorful sunset and lots of graphic elements along the waterfront. Today’s photo is similar to yesterday’s photo in technical problems—shooting into a bright light. Again, I decided on the exposure I wanted for the ambient light, selected the spot that I wanted to have Kelly run through and then set the power on two Nikon SB800s that we had posted on each side of Kelly. Looking at the photo on my monitor, I had a decision to make: do I want Kelly to be straight or do I want the horizon in the background to be straight. I decided that I wanted Kelly to be straight. Camera settings: Nikon D3, Nikon 70-200mm f/2.8 at 86mm, shot at ISO 200, f/6.7 and 1/250th of a second with a SB-800 at 1/4th and 1/8th power on each side of and pointed at Kelly. Nicely done Larry. This is my favorite of the three. I would like to see all three cropped a little tighter though, to emphasized Kelly even more. I usually like to include more of the environment than some other photographers would. However on these shots, which I am assuming are portfolio shots, I can't help but think there may be a little too much of a good thing. Not sure what you meant by soft focus. This one looks like it is completely focused. Good action shot with stunning background. I like everything about this photo except the dark shadow on her leg. Without that shadow, this photo would be a home run. Like what you are doing here. You did a good job here. I think you captured her the way she would have wanted. Like the colors and the graphics behind her. Ok, here goes. 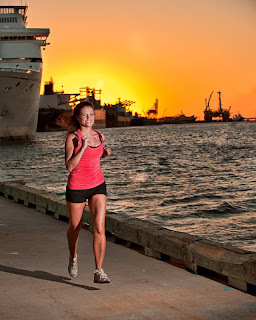 I like the setting, background and her jogging along the dock. I really like her feet floating as she jogs. But, I will have to assume a Bright flood light that came on before the sun set casting the dark shadow on her leg and behind/side. She is an atractive lady that appears to be having a great time. It is good to see an unexpected environment in this shoot. You were able to capture a very different pose her. I like most everything about it, except the heavy shadows on the one side. But, I must admit, no shadows would make it really look funny.